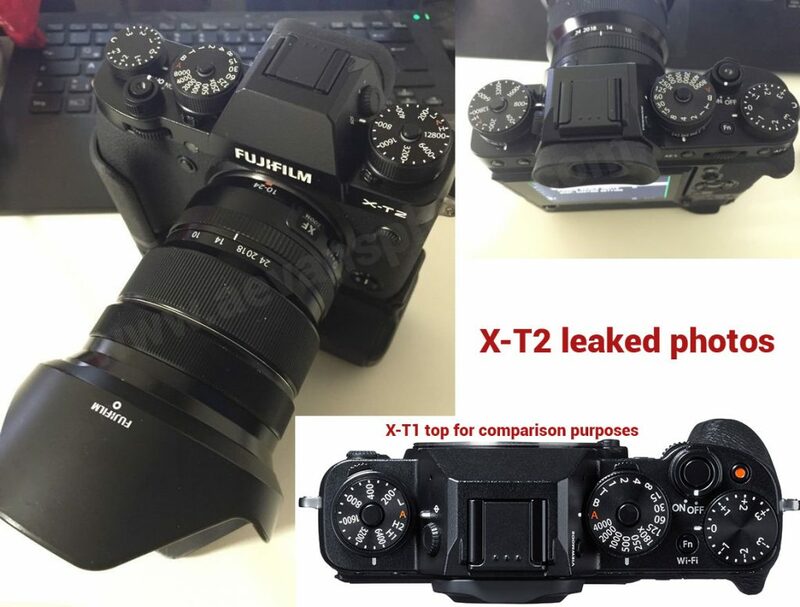 BREAKING NEWS :: First Fuji X-T2 already FOR SALE on eBay for £1,999 (with XF10-24)!!! – Great Spot vicmay! Anyway, I decided I’d go to the ebay link and get some photos off there and enhance one of them a tad so we can all have a look. Firstly, let’s look at the rear and the new grip. Seems like they have removed the FA (focus assist) buttons on the body and the grip in favour of the joystick. The joystick on the X-Pro 2 is amazing so I’d say this is an excellent choice. There seems to be an inclusion of a “multi” photometry setting too. Just like on the Xpro2. This is something like the matrix (Nikon) or evaluative (Canon) metering. The grip now has a “boost” mode. What’s this for I wonder? Perhaps to give more frames per second (at the expense of battery power) or maybe to increase overall performance in areas such as auto-focus, I’m really not sure what it does, but it’s cool. Note: Turns out it boosts FPS. Hopefully the grip will hold two batteries with one in the camera and for me the ultimate would be a way to plug it into mains power for a constant power supply. This would be handy for video recording and shooting things like timelapse. Note: YES, it’s confirmed the grip holds two batteries (with one in the body) so 3 batteries in total. Great news. Additionally you can see the dials have been beefed up a bit (which is good for me and my large hands) the rear directional pad seems to be less recessed, which was a common complaint concerning the X-T1. 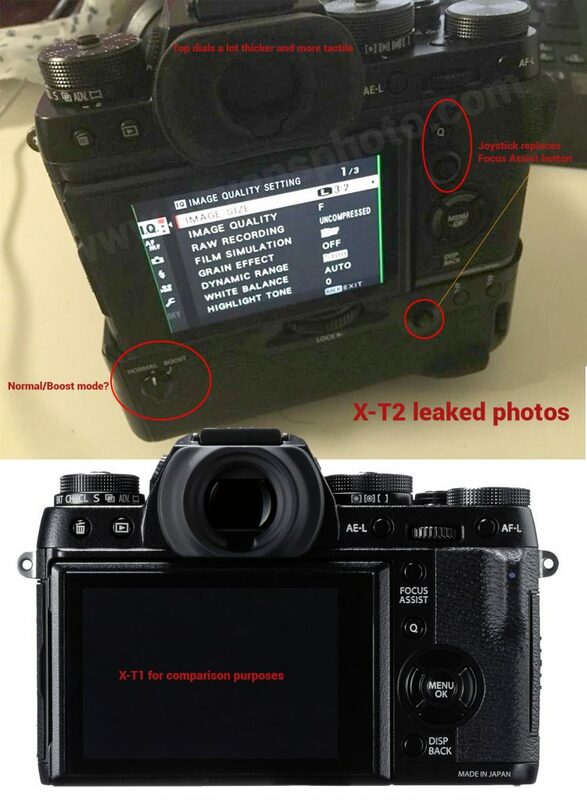 We can also see the new menu system that’s also in the X-Pro2. This is a lot better than the old system but somethings are a bit hard to find so it’s still not perfect. Overall, from this first shot, I’d say the improvements are subtle but definately on the right track. From the top view shots we can see the ISO dial maximum has increased from 6400 to 12800. This is in line with the improvements in the X-Pro2 so we should see very similar IQ coming from the X-T2. The iso dial also has H1 and H2 removed in favour of H, A and L which is purely a reflection of the moving from a max native ISO of 6400 to 12800 as mentioned above. The max shutter speed has increased to 1/8000 (as seen with the X-Pro 2). where’s the VIDEO RECORD BUTTON?!?! I had hopes the X-T2 would have pretty good video camera functions (not perfect of course, but good). The lack of a video record button seems odd to me. Most likely the fn button has taken over this role. Which may or may not be a good thing, depending on who you talk to. I suspect the video record button was removed because of complaints about accidently triggering it, I was never a X-T1 user (though I’ve used one) so I’m not too sure. So, that’s my thoughts on this.